Prologue: At a hideout somewhere in China, a pair of underworld miscreants (Beancurd and Gorko) meet to discuss their success at the illegal spice trade. Their tainted spices have been sold to all the restaurants in the city save a the most popular joint in town... and Gorko wants in. As they discuss the matter, a twisted creature in a cage tries to swipe some of their food. This creature is Fong, who used to be a normal person until he ate some of the tainted spice straight from the can. Meanwhile, a boat arrives in China (they never say what city) carrying the Turtles, who are thrilled to begin their vacation in “the old country”. The Turtles get directions to the best joint in town and are taken to Hu-Shang’s. They arrive just as Beancurd’s men start defacing the building to intimidate its owner. The Turtles break out their weapons and send the punks packing. Hu-Shang thanks the Turtles for helping him and offers them a meal out of gratitude. Just then, Chang Lee, Hu-Shang’s nephew, comes by for a visit. They all sit down to dinner but are interrupted by Beancurd himself. Beancurd tells Hu-Shang he has one last chance to start using his tainted MSG, but Hu-Shang says he values health and integrity too much to submit. Beancurd sends his thugs after Hu-Shang and the Turtles are about to intervene when Chang Lee stops them. Chang says that this is a family matter and that he’ll deal with it. 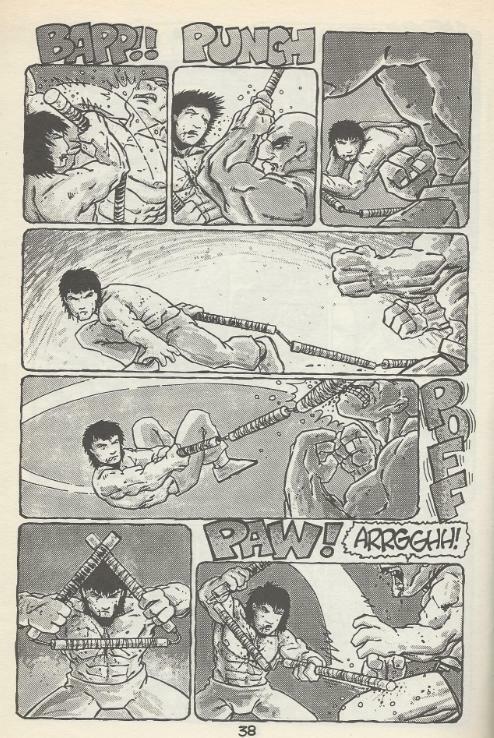 Revealing that he’s a martial arts master, Chang takes down Bugsy the Butcher, Pretty Boy Bob and Ching Lo Lefty with ease. With no more muscle to rely on, Beancurd retreats. Beancurd returns to Gorko with the bad news. Gorko finishes feeding Fong a can of MSG and says that he’s going to call in the reserves: Buff Nordick. At a castle near the mountains, the gargantuan Buff Nordick makes short work of his sparring partners just in time for lunch. His servant brings him a bowl of turtle soup and Nordick has a flashback. He recalls being a small boy back on the farm, accidentally falling into a pen full of turtles and getting scared. 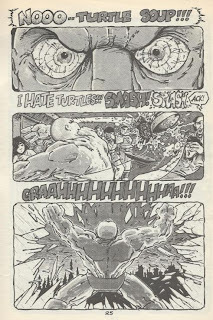 Nordick smashes a window and preaches his hatred of turtles to the skies. Elsewhere, the Turtles find their dive of a motel and turn in for the night. The next morning, they head back to Hu-Shang’s and find it on fire. Apparently, Beancurd came back in the night and torched the restaurant. The Turtles help Chang Lee rebuild the place, then they leave to exact revenge on Beancurd and his boss. Travelling through the bad part of town, they storm into Gorko’s headquarters and demand that the intimidation techniques stop. Gorko and Beancurd unleash their thugs, but the Turtles and Chang Lee work them over without breaking a sweat. Gorko then reveals his trump card and Buff Nordick storms the scene. The Turtles want to take him down (as Nordick exclaims how much he hates turtles), but Chang insists on fighting him. 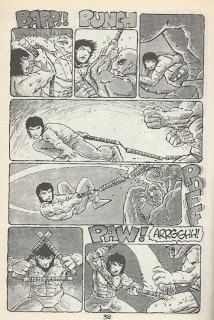 Nordick takes the upper hand until Mikey gives Chang a pair of nunchakus. Chang trounces Nordick and the Turtles round up Gorko and Beancurd. The two mobsters beg for mercy and Leo tells them that they have a very specific revenge in mind. Back at Hu-Shang’s, Hu-Shang thanks the Turtles and his nephew for saving the day. He also thanks them for his new bus boy, sandwich board carrier and janitor: Buff Nordick, Gorko and Beancurd. *Being a guest issue, this one is considered non-canon. 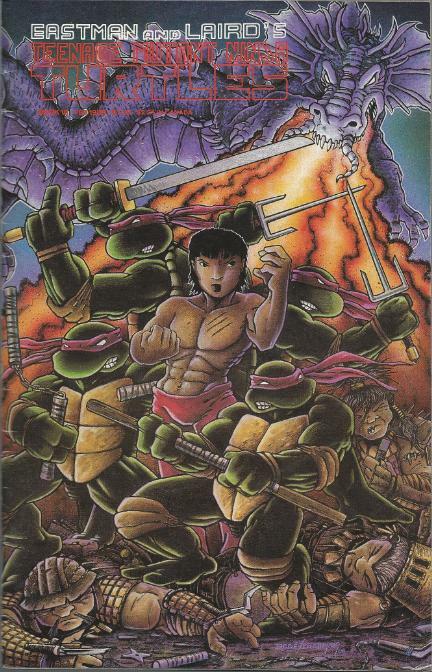 It actually predates the official start of the "guest era", which will begin following TMNT (Vol. 1) #21. *This issue was reprinted in full color (by Bode’ and Bill Fitts) in December, 1990 with a new cover by Bode’. 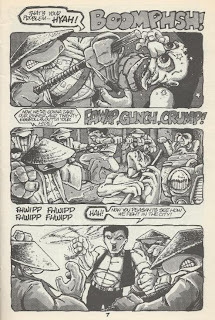 *The original black and whites for this issue were cleaned up and reprinted in TMNT 25th: A Quarter Century Celebration. Mark Bode’ has a cartooning style I really, really like. It has a quality I can’t precisely pinpoint, but I love reading his stuff. He draws his characters in a scale somewhere between normal and stunted and he has a great way of flip-flopping between an irreverent cartoony look and a gritty action-oriented style. But that’s not so much a knock against it, really. Most of the guest issues in Vol. 1 are going to be wacky comedy stuff, but so far as wacky comedy stuff is concerned, “The Shell of the Dragon” is on the higher end of things. I mean, it’s only the second guest issue in the series, so from that perspective the entire concept of out-of-continuity guest stories hasn’t grown tiresome yet. Bode’ does a decent job of balancing the action out between the TMNT and his “original” character, Chang Lee (or at least as original a character as a Bruce Lee parody can be). In a lot of guest stories that feature a character created by the writer, the Turtles tend to play second fiddle to this new individual the writer insists on promoting as the next best thing since Casey Jones. TMNT (Vol. 1) #29 is especially guilty of that. 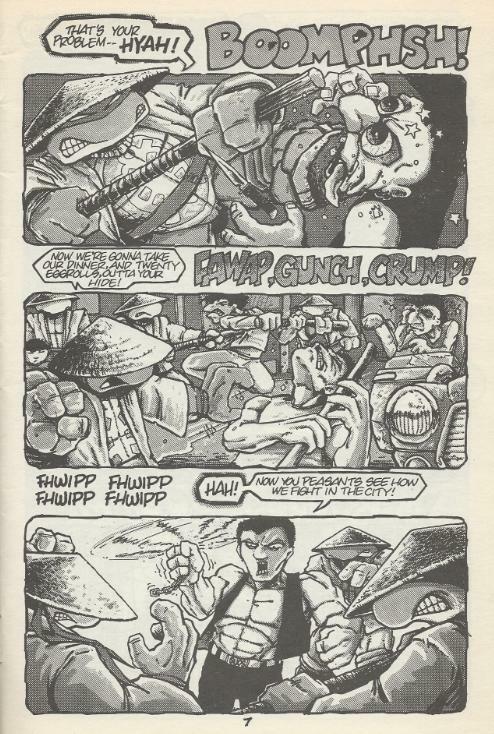 But although Chang eats up most of the best fights, the Turtles get plenty of licks in, albeit while doing battle with minor thugs instead of the named adversaries. There are some weird artifacts in the lettering and scripting that I can’t quite wrap my head around. The Turtles use the phrase “I is ___” frequently and I have no clue what Bode’ was going for with that. Did he think they were cavemen? Some characters also get their names misspelled from time to time, like Gorko being spelled “Gurko”. In a really weird moment, Beancurd is addressed as “Mushu” on the final page. Another unfortunate failing very typical of these guest issues is that none of the Turtles display a unique personality. They all act like interchangeable clones of one-another and their dialogue is entirely swappable. I understand that even with 40 pages, Bode’ had to introduce both the plot and his new characters, but he could have at least made an effort to render the Turtles’ dialogue in their own voices. “Shell of the Dragon” is a fun issue. It’s a comedy story to be sure, but it doesn’t take the humor to surreal places like the guest issues by Mark Martin or Hedden & McWeeney. I wouldn’t call the comedy understated by any stretch (everything involving Buff Nordick is absurd), but the humor never overshadows the martial arts action. Why is this considered a guest issue when it's co-written by Eastman? What dose Fong look like? Can you post a pic?